Successful workshop projects start with careful, accurate measuring, marking and layout. The most critical elements in these steps of the proccss are good planning, accurate measuring and using sharp marking tools that create readable lines. The level of precision needed varies according to the intricacy and complexity of your project. 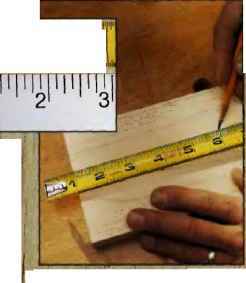 Rough carpentry (for example, putting up stud walls or installing floor underlayment or roof decking) requires a certain amount of'care, but generally you can achieve satisfactory results using tape measures, framing squares and a lumber pencil as a marking tool. 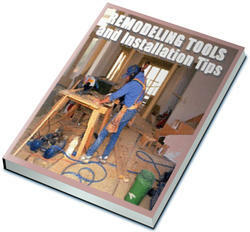 Trim carpentry (installing moldings and decorative trim) requires a higher degree of accuracy, so you'll want to involve steel rules, levels and angle gauges in the process. A good sharp pencil will usually give you marking lines of acceptable accuracy. 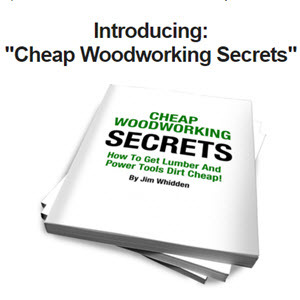 Fine woodworking carries the highest standard of accuracy. You'll want to use marking gauges, compasses and any of a wide selection of specialty measuring tools to create well-made projects. 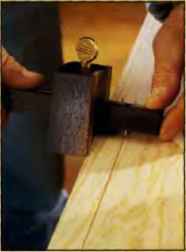 Generally, a marking knife or a scratch awl is the marking tool of choice for fine woodworking. USING THE END HOOK as a starting point when taking measurements with a tape measure can be unreliable, as illustrated by the ptioto above. USE A GREASE PENCIL to mark metal, plastic and other materials that can't be marked clearly with a pencii. ATTACH MEDIUM GRIT SANDPAPER to your toolbox to make a convenient and safe sharpener for lumber pencils.